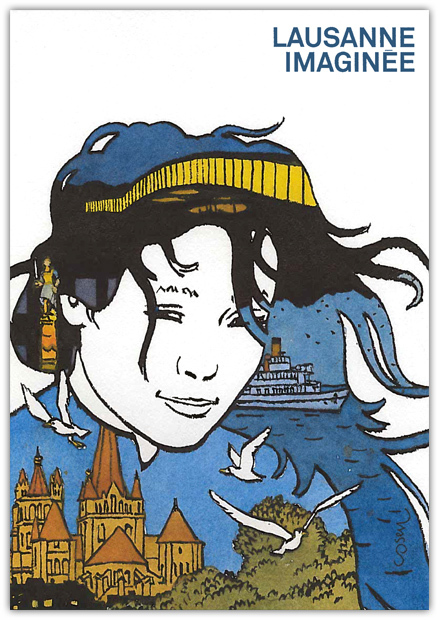 An original idea of the City of Lausanne: the city offers a book titled ‘Lausanne Imaginée’ to its young citizens who celebrate thier 18th birthday. In the album (approximately 100 pages), 24 artists tell their stories about Lausanne. Cosey drew the beautiful cover for the album. The book contains stories by interesting artists like Peggy Adam, Anna Sommer, Tom Tirabosco, Pierre Wazem, edmond Baudoin and many others. The album was presented during a ‘vernissage’ in Lausanne on 17 april 2019. Here is Cosey with Mr. Grégoire Junod of the City of Lausanne. In Charmey, you can vist an interesting exposition until 5 may. The exposition is a project by swiss artist David Brülhart. Brülhart is a graphic artist, part of his work is ‘narrative art’, among which a graphic novel ‘La Vie Sauvage’ (in cooperation with Tony O’Neill). In 2016, he embarked on the ship ‘Knut’, to visit Spitsbergen, the famous island of the Svalbard archipelago in the Arctic Sea. 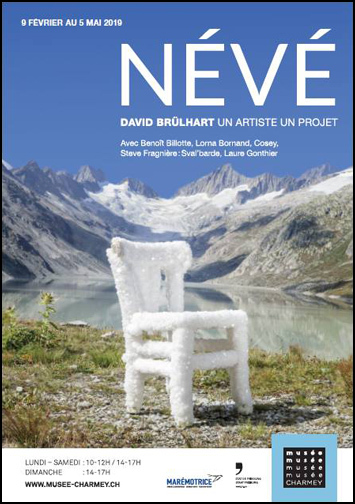 With his sketches and notes from this expedition, he started the project ‘Névé’, with glaciers as his inspiration. The result is an exposition in Musée Charmey – an exposition of Brülharts work, of course, but also with works of several other artists – among whom we find Cosey. The exposition is spread over several locations in Charmey. In the Musée Charmey, you can works of Brülhart, Laure Gonthier, Lorna Bornand, Benoît Billotte, while you listen to a sound installation by Steve Fragnière. And… you will find sketchbooks and original pages made by Cosey. In another location, the Galerie de l’Hôtel Cailler, you can see images of the salt chair of Brülhart (see the poster above), together with reproductions on a large format of drawings by Cosey. 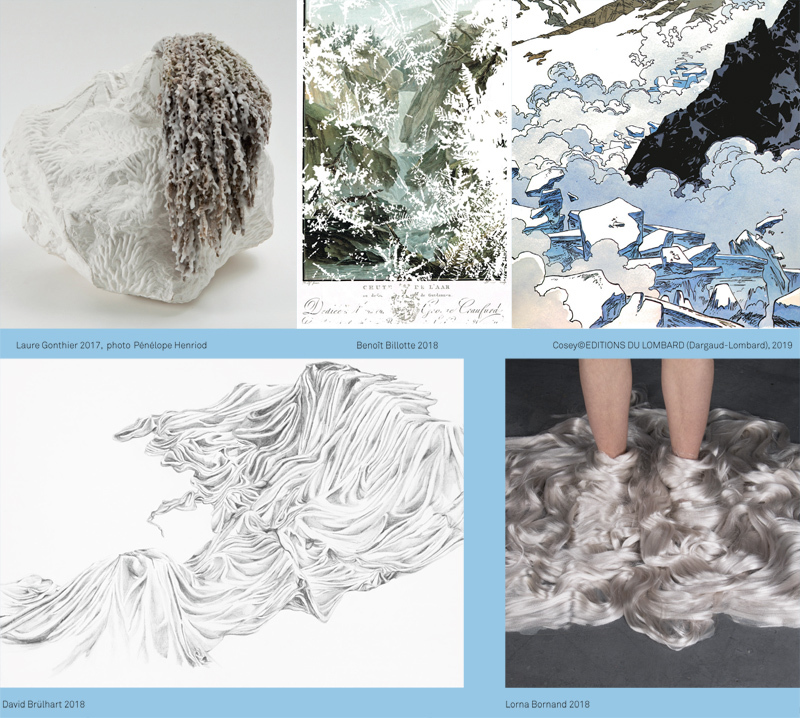 From the expositions flyer, I clipped the images of various works. It looks like a very interesting exposition. A happy new year to all fans of Cosey! In 2019, we may expect a new album by Cosey. If all goes well, his new Minnie Mouse album will be in your bookstore in october. This first post of 2019 is a kind of a milestone for me and ‘The World of Cosey’, as this is is the 250th ‘NEWS’-message of the site. I thank you all for visiting my site and for contributing to it by sending me news about Cosey. I hope you will continue to do so! Cosey is currently working on a new project: a story about Minnie Mouse. If all goes well, the album will be published by Glénat in the autumn of 2019. In interviews after the publication of ‘Une mystérieuse mélodie’ and ‘Calypso’, Cosey has often mentioned he had a second scenario for a Mickey story. 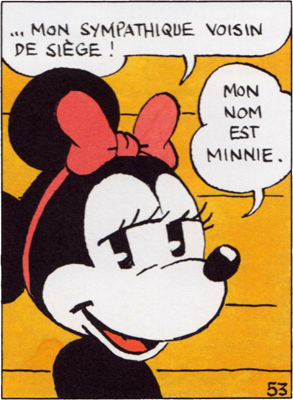 At the time, it was still unsure if authors were allowed to make a second story in Glénat’s Mickey-albums. Apparently, Cosey has got a ‘go’ for the project. 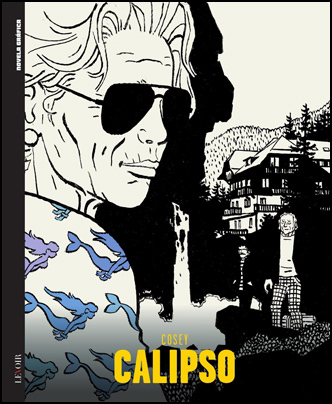 A spanish edition of Calypso has been published by Dolmen Editorial. As far as I know, this must be the third translation (after dutch and portuguese). 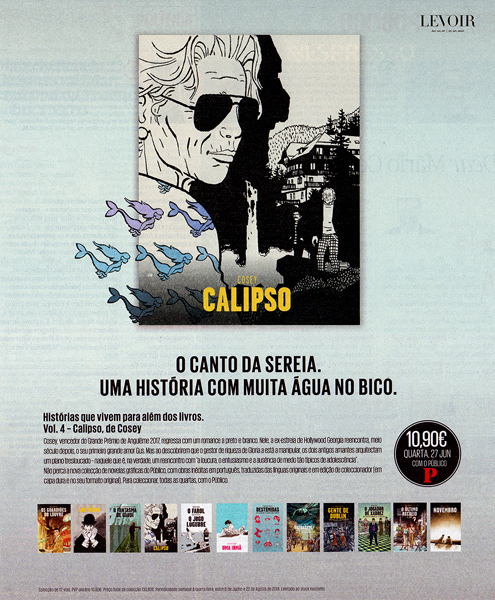 Recently, a portuguese translation of ‘Calypso’ has been published by Levoir – portuguese title is ‘Calipso’. I like the advertisement of Levoir below: the way the mermaids swim into the dress. 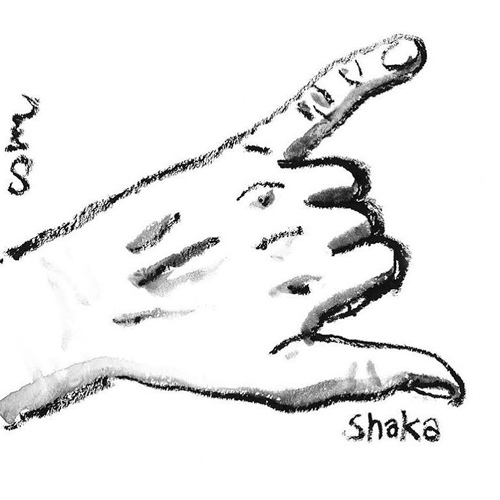 A drawing of ‘shaka’, the Hawaiian greeting gesture that is popular among surfers. Cosey made it a few weeks ago for the R4tC (Ride for the Cause), a paddling sports event in Montreux – this year from 30 august till 2 september. The event is a fund rasing event for ‘WAVES for development’ and ‘Summit Foundation’. The Cahier has 88 pages with a soft cover. 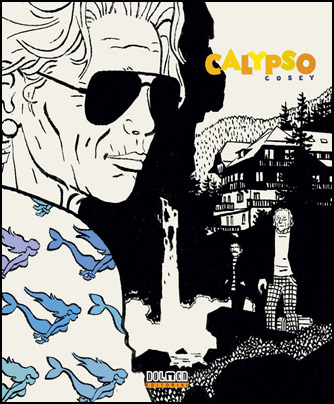 On the cover, a drawing by Cosey referring to his ‘Le Voyage en Italie’, the first album of the Aire Libre collection in 1988. 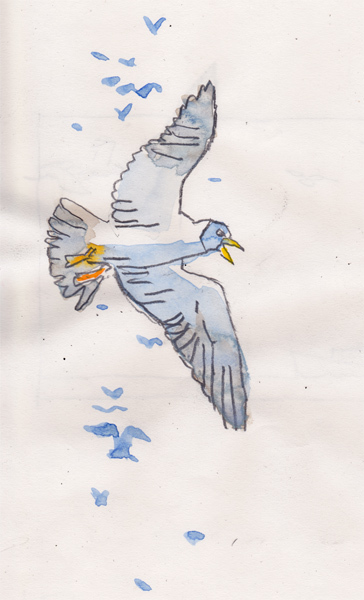 This drawing was originally made for the 20th anniversary of Aire Libre. 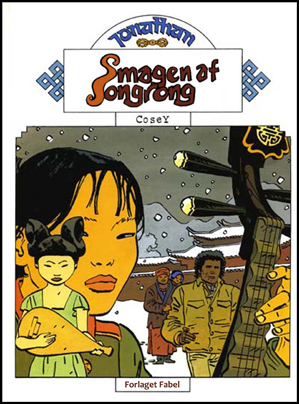 The interview with Cosey is based on a round table discussion during the Festival de la BD in Angoulême in january this year. More information on the site of Dupuis. 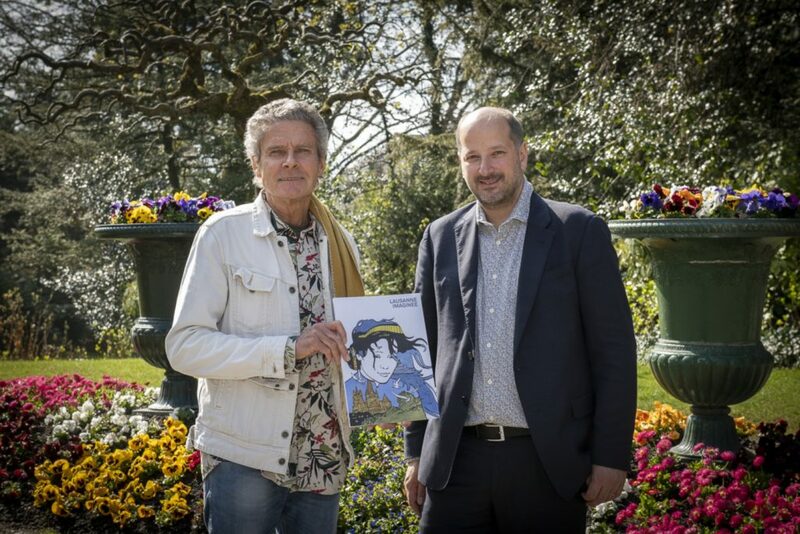 The swiss Château de Sint Maurice hosts an exposition (until 11 november 2018) about Petzi, a famous childrens book character. 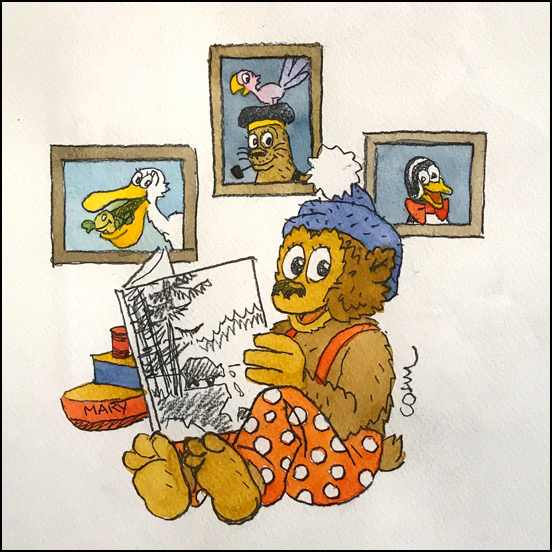 The first Petzi stories were created in 1951 by danish authors Carla Hansen and Vilhelm Hansen. 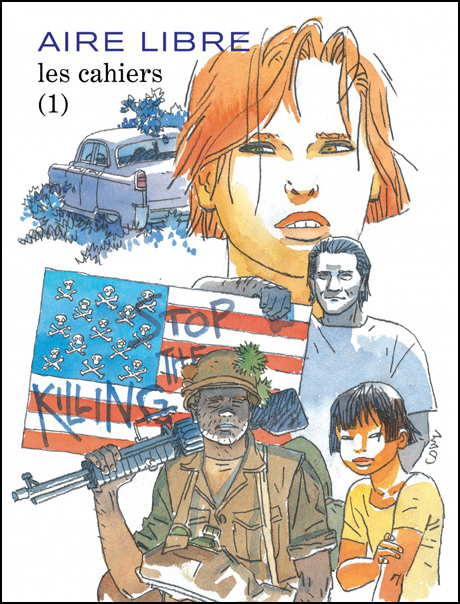 Since 2016, a swiss publisher is publishing the stories again in their original form for the french speaking market. 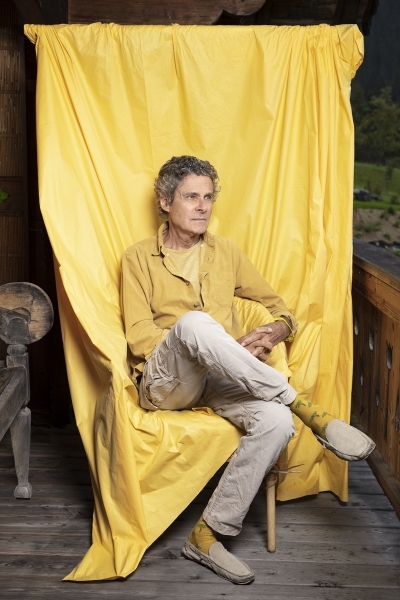 Some 25 swiss artists, among them Cosey, made a hommage to the little bear. More information on the website of the Château: click here. 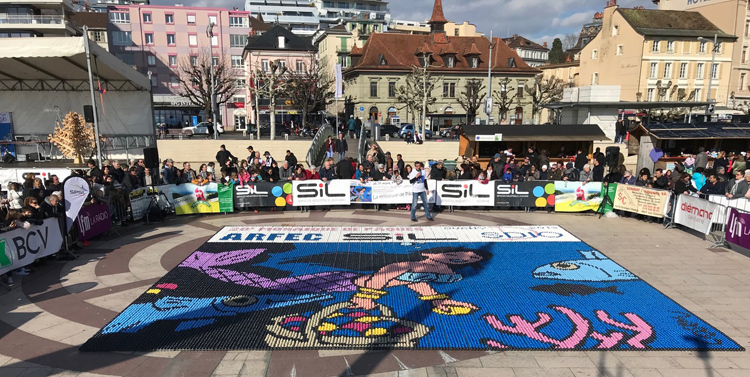 During the Easter weekend, a giant mosaic in Easter eggs were made by volunteers in Ouchy. 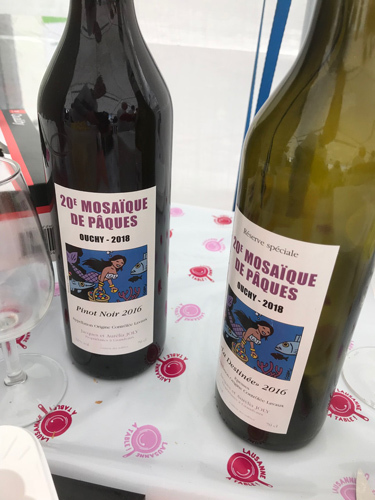 People could buy an egg, and so money is collected for the ARFEC, ‘Association Romande des Familles d’Enfants atteints d’un Cancer’ (Association of Romandy Families of Children affected by Cancer). The eggs were placed in packages of 30 eggs, in 34 columns and 39 lines… a stunning 39.780 eggs. Sold for 1 CHF each and add to this other income from visitors and sponsors and more than 50.000 CHF were raised for ARFEC. One of the volunteers was Bernard Matthey-Doret, and he sent me this ‘work document’, showing the grid of eggs. Wine bottles with special labels. Cosey present during the works. More information and interesting pictures of the work in progress: visit this Facebook-page. A few weeks ago I announced the publication of a black & white edition of ‘À la recherche de Peter Pan’ by Éditions Niffle. Unfortunately, the project is put on hold. The original planning for the release of the album was the end of january, but now the book release is postponed to an unknown date. Publisher Éditions Niffle let me know that the design for the book is ready, but other factors determine the delay. 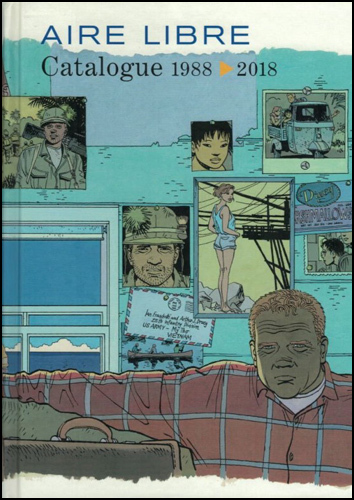 My guess is that there have been several novelties recently (Calypso in october, the Angoulême catalogue in january, the bi-colour edition of ‘Le Voyage en Italie’ also in january) and that the delay is decided for marketing reasons. Hopefully the album will be published later. Every year, the swiss ARFEC organisation organises an Easter fund raising. 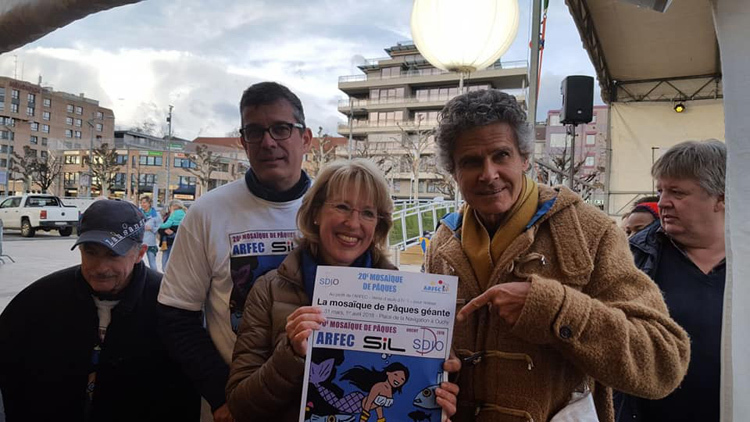 ARFEC is the ‘Association Romande des Familles d’Enfants atteints d’un Cancer’ (Association of Romandy Families of Children affected by Cancer). 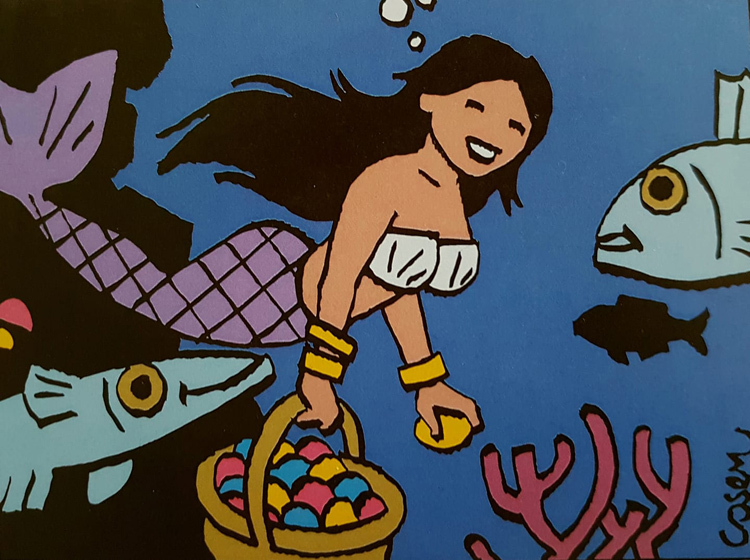 The goal of the action is to make a giant mosaic of easter eggs, for which Cosey made the design this year. People can buy eggs and volunteers build up the mosaic. The money collected by the egg sales goes to the ARFEC organisation. 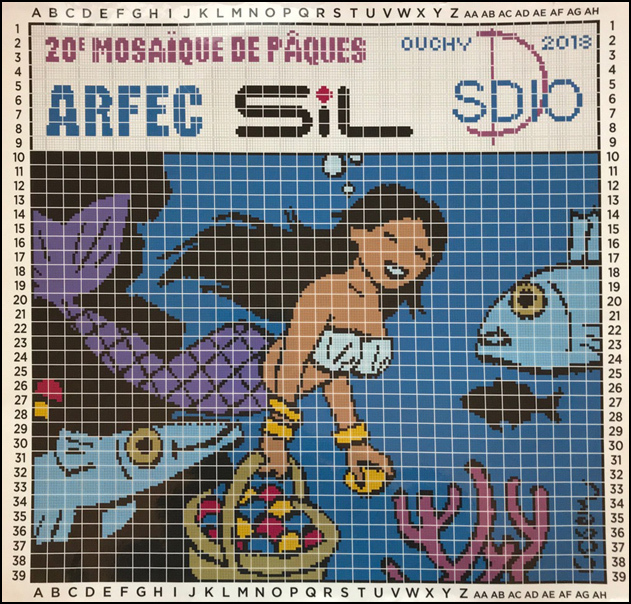 The mosaic will be built between 29 March and 1 April in Ouchy. I am curious to see the result! 30 Years ago, the ‘Aire Libre’ collection of Dupuis was born. Jean van Hamme and Philippe Vandooren were the Dupuis directors who started the collection. First album in the collection: ‘le Voyage en Italie’ by Cosey. 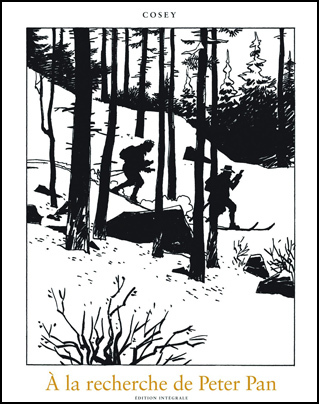 To celebrate its 30th anniversary, Dupuis published this catalogue… unfortunately only available to realtions of Dupuis. It contains 200 pages with all album covers of the entire collection. You can see a web version of the catalogue on the website of Dupuis.